For the first time in my career I had the opportunity to teach songwriting to elementary school level children. The class consisted of kids in third to fifth grades, mostly whom had no music background. I was well aware that the music theory concepts that I’ve used all along in my career weren’t going to be effective as a starting point for instruction. I had to think about music creation in a wholly new way, and in doing so, I believe I ended up being the one that learned the most in the class! In preparing for the class I had to think about those most elemental questions of composition: What is the raw material of music? How are those materials combined to make music? What is a music maker’s creative process? How do you know when you’ve arrived at a final product? Wrestling with these questions proved incredibly enlightening to me. WHAT IS THE “COMPOSER” DOING? To begin, the class and I had to arrive at the most basic understanding of what a piece of music is and what it is doing. We couldn’t talk about “songs,” “songwriting,” or “composition.” Those words/concepts already contained too many layers of information. The understanding had to be more direct. We went into exploration mode and listened to pop music and discussed what we heard coming from the speakers: There were sounds. Some sounds came and went. Some sounds repeated more, some repeated less. Some sounds were higher, some were lower. There seemed to be a plan for when sounds happened. Moments felt “right” for certain sounds to come and go. When sounds got “boring” new sounds appeared. When the “new” got “old,” maybe the old came back as something new. We started noticing organization and patterns in the presentation of the sounds over the course of songs. We noticed that similar patterns appeared across many different songs. We talked about the traditional verse/chorus and the modern build/drop structures, and that was as far as we got with anything close to music theory. Question: What is it that the composer is doing? Answer: Organizing sounds over a period of time. And within that period of time the composer is organizing the presentation, layering and interaction of those sounds. Organizing the new and exciting sounds versus the ones that became old and familiar thru repetition. Possibly one becoming the other and back. Layering different sounds, experimenting with high pitch sounds over low pitch sounds. Organizing the simple in relation to the busy. Answer: To create an “experience”. An experience that engaged the listener until the end. That’s all we needed to know. But the next, all important question was, How do we do it? It used to be that composers had to make creative choices about everything that happened over the course of a piece. One had to define all of the pitches and chords along with their durations and placement. And typically it also required training and skill on a musical instrument that one would use as the composition tool and/or the sound source for recording. But modern music-making technology allows one to make music without working at that same nuts and bolts level. Now one can create from, as I like to call it, a different “zoom level.” Using pre-made sounds and longer musical phrases such as loops, one can organize a musical experience from a more zoomed out level. This zoomed out method of music creation is something of a hybrid of arranging and composing: the music creator is planning overall organization while also making choices of some sonic details. Unlike a similar “zooming” development that happened in the 1970s when turntables evolved to become instruments of sound manipulation and/or song section re-ordering/arranging, the current situation does not require a high level of instrument skill (in this example, the instrument being the turntables). Today, a set up such as using pre-made loops on GarageBand for iPad has obliterated the barriers of entry! This paradigm shift is what made this class possible. Had this zoom level development and technological advance not happened, this “how” would have not been available for kids with limited musical knowledge and instrument skill. I should also mention that the reverse is also true—one can create at a previously unavailable “zoomed in” level where one can play with the infinite possibilities of sound manipulation using modern digital tools and techniques (e.g., granular synthesis). A sound can now be molded and worked on at a much more elemental level than ever before. So a paradigm shift of “zoom” happened in both directions, simultaneously in and out from the traditional point of departure of pitches/durations and other traditional music theory concepts, allowing for more in-depth as well as more simplified music creation. 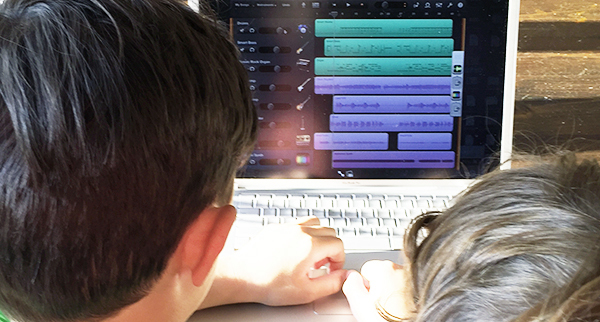 The kids’ primary creative choices for working with pre-made “zoomed out” sonic material (loops) were: 1) choosing sounds and deciding how to layer them, 2) sound placement and duration (loop repetition), and 3) overall organization of sounds over the length of the piece. Using these descriptors we came up with some basic guidelines for layering sounds. “High” with “low” is pretty safe. “High” with “high” or “low” with “low”—handle with care. “Simple” with “simple” is safe. “Simple” with “busy” could be okay. “Busy” on “busy”—handle with extra care! After the kids developed good instincts on choosing and layering sounds, we moved on to the other two types of choices—taken together, figuring out how to arrange the sounds over the course of the piece to keep listeners listening, all the way to the end. This is what we spent the most time on. We went back to listening to pop songs. Sounds repeated often, but the amount always felt right. Never too much or too little. When a sound got to be too much it either went away or changed just enough to reset the interest. We talked about how a smart and well thought out presentation of sounds can keep us interested and how a badly constructed presentation can potentially make us bored or confused. Too much of the same and the listener’s attention drifts. Too much change the listener may get lost and, similarly, tune out. We talked about the technique of “pacing” to organize our sounds in order to hold listeners’ attention. For listeners to get in the groove of a song we knew that we needed a healthy dose of repetition. But good pacing made the repetition work and not become tedious. We arrived at the idea of “a little bit the same and a little bit different.” We talked about how when sounds repeated or came back, having the sound or layering be a little the same and a little different was useful in keeping the listener interested. We also decided that lengths or repetitions of 4, 8, and, 16 seemed to work best. Now that we had the tools for making good creative choices, the kids were ready to go on their own. Half the class time was “lab time” in which they worked solo, or sometimes in pairs, to create pieces. At the end of each day we had a wrap-up show and tell session, where we played a few work-in-progress pieces for everyone to hear and comment on. Some kids were a little anxious to show (we never forced anybody to show), but as they saw everybody having so much fun they began sharing too. There was a lot of peer learning from all the sharing. Through one-on-one input/revising and the show and tell sessions the kids slowly arrived at their finished pieces that were played at the final recital for family and friends. There were kids who followed the guidelines and created some great stuff. Their talent was in using the rules as helpful guides that inspired them but did not stifle them. They flourished within the lines. But there were also some rule breakers who created great things. One particular kid ignored the “a little the same, a little different” idea and created a through-composed piece that really worked. He had an instinct for picking sounds that kept you interested but never overwhelmed. It was proof that instinct can sometimes beat set methods or rules. Overall, the class was a great experience. The kids were inspiring and fun and taught me a lot. There were two main takeaways for me. The first was that if you teach something the same way you leaned it, you’ll just be teaching. But if you teach it differently from how you learned it, you will also be learning. The deconstruction and re-think of familiar material can be a fresh reintroduction to a topic or a craft you’ve known (a certain way) for many years. You’ll end up knowing it deeper than ever. You’ll understand it from other points of view and see new relations and connections in it. It might breathe some new life into the thing that you’ve thought about or done so many times in a specific way that it possibly became somewhat lifeless. The other takeaway was that the deconstruction of the composing process that I did in preparation for the class, as well as together with the class, turned out to be of great benefit to me as a composer. Tearing down the concepts and approaches that I have developed (and ingrained in myself) over the course of years opened the possibility of creating from a more open and intuitive place. Thinking “simple,” ”busy,” “high,” “low,” “familiar,” and “new,” as opposed to the more rigid concepts of scales, chords, rhythmic subdivisions, etc., can be a freeing creative experience. I think it has gotten me closer to working from a more uninhibited place with less conceptual restrictions. An interesting observation that I’d made some years ago comes to mind. Creative individuals who are formally trained in other disciplines such as visual arts but have no music background, sometimes are able to create truly compelling music. Now I see that without the burden of received music or traditional songcraft rules these cross-disciplinary artists were able create in a more open-ended and natural way. Of course, this is an oft-discussed dilemma for artists across many disciplines. How do we achieve technical proficiency in a craft and then “un-learn” it to strive for direct, fresh expression? Surprisingly, this teaching experience showed me a possible way. Whatever your area of expertise might be, if you get the chance to deconstruct its concepts down to the point of being teachable to an eight-year-old, I believe you will gain incredible insights. You’ll be the one standing in the front of the room, but you’ll be very much the most rewarded (and tallest) student! This entry was posted on Monday, October 2nd, 2017 at 7:14 pm	and is filed under teaching. You can follow any responses to this entry through the RSS 2.0 feed. You can leave a response, or trackback from your own site. Thank you for stopping by and thank you for commenting on the post Lyndol! Seems like the by-product of teaching is almost always learning something new.